Save wiring costs by using voice-grade copper wire—even phone wire you already have installed. 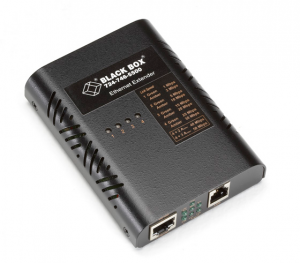 Extends 10- or 100-Mbps Ethernet up to 1.2 miles (2 km). Perfect for connecting an isolated user in another building or in another part of a large building. Symmetrical VDSL supports speeds of up to 50 Mbps. Rackmountable in the LinkGain Chassis (LB300A-RACK). Ten speeds with easy-to-read speed indicator LEDs on top of the extender. Auto MDI/MDI-X on the Ethernet ports. Autosensing for Ethernet speed and duplex. A switch configures the extender for local (CO) or remote (CPE) use.